Kano (Nigeria): At least 31 people were killed in twin suicide bomb attacks on a town in north-east Nigeria on Sunday. Two blasts ripped through the town of Damboa in Borno state on Saturday evening targeting people returning from celebrating the Eid al-Fitr holiday, in an attack bearing all the hallmarks of Boko Haram. Following the suicide bombings, the jihadists fired rocket-propelled grenades into the crowds that had gathered at the scene of the attacks, driving the number of casualties higher. Officials warned that the death toll is most likely to increase. The jihadist group has deployed suicide bombers, many of them young girls, in mosques, markets and camps housing people displaced by the nine-year insurgency which has devastated Nigeria's north-east region. 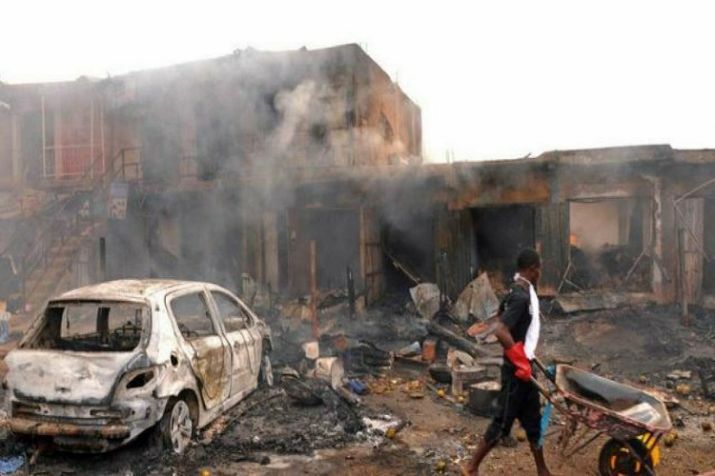 On May 1 at least 86 people were killed in twin suicide blasts targeting a mosque and a nearby market in the town of Mubi in neighbouring Adamawa state. Nigerian President Muhammadu Buhari came into power in 2015 vowing to stamp out Boko Haram but the jihadists continue to stage frequent attacks, targeting both civilians and security forces. The militants stormed the Government Girls Technical College in Dapchi on February 19, seizing over 100 schoolgirls in a carbon copy of the abduction in a carbon copy of the abduction in Chibok in 2014 that caused global outrage.